With Ohio LinuxFest just around the corner I thought it was about time we added the planners for this awesome LinuxFest to join in the People, Personalities, and Planners series. In this first interview for the Ohio LinuxFest Planners I am talking to Beth Lynn Eicher . Before we move on to the questions I have to give a little background about meeting Beth Lynn for the first time I want to share. It was last year at the 2009 Southeast LinuxFest that was held in Clemson, SC. My husband was one of the speakers so I tagged along to see what all the "fuss" was about since I recently began using Ubuntu and I am sure glad I did. One because it was my very first LinuxFest and two because I met some amazing people one of which is Beth Lynn Eicher. Beth Lynn motivated and inspired me at the pre-party of SELF last year. I was sitting at a table with a large group of speakers feeling pretty out of place and she asked me who I was. I told her something along the lines of "Oh I'm not a speaker or anything special like all the other folks at this table; they just said I could come because my husband is speaking tomorrow." I barely finished the statement before Beth Lynn said something I have not forgotten. She said, "You are someone special, and your opinion matters just as much as theirs." But is was more than her words. It was her facial expression and body language as well. She said this conviction and passion. I remember thinking who is this person who values my opinions as much as she values the seasoned Linux veterans? We talked at length that night and the next day at the event. It was truly one of those moments in my personal journey through the FOSS world that will stand out in my mind. Those of you who know Beth Lynn I am sure can picture this conversation. Those who don't know her personally, if you get the opportunity to say "hi" to her please do. Amber Graner: Beth Lynn thank you so much for taking time to answer some questions for me and tell readers about the Ohio LinuxFest. 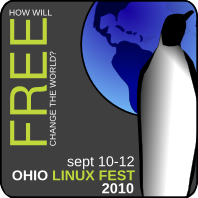 Can you tell us a little about you and your role with the Ohio LinuxFest ? How long you have worked on this event? Beth Lynn Eicher: I came to olf at year 2 in 2004. While I had 5 years experience planning user group meetings, the only large scale event planning experience I had prior to this was my own wedding. My initial role was BOF and lunch coordinator. Somehow that spun into Treasurer when the Ohio LinuxFest became a corporation in 2005. I have held this role ever since. BLE: I am a professional Linux system administrator as I have been for over 11 years. Some people wonder “how can anybody make any money on Free software?” Personally I have had a financially and intellectually rewarding career while not specializing in a proprietary operating system. If I had stayed an IRIX administrator I would have been out of work due to the vendor itself killing off a proprietary UNIX. BLE: I found a Red Hat Linux box using an Alpha processor on my desk in 1999 while I was interning as a research programmer at Pittsburgh Supercomputing Center. Immediately I reached out to my home user group, Western PA Linux User Group, for help. Back then the web browser was not a default package so I attempted to build Mozilla on the Alpha from scratch. Since then I’ve been using Red Hat, Fedora, and SUSE products at work. In 2005 I heard much great buzz about Ubuntu. I was very intrigued by Debian-based since I used was using KNOPPIX as rescue media and try-it-before-you-install-it Live CD environment. When I tried Ubuntu I was very impressed. It continues to be an excellent desktop operating system. Today I have both Ubuntu and Fedora based systems at home. I use Ubuntu so I can try software before I recommend it to friends and family. I use Fedora for Freedom. While I am officially a Fedora contributor, I encourage everyone be open to the many great Free software available today. Choice means more Free software for everybody. BLE: A LinuxFest needs all sorts of people to make it all possible. Please check out our how to help page if you want to join our team this year. As treasurer I’d like to have more staffing in the sponsorship sales and customer service area. People shy away from it because they are afraid of rejection. It is a shame because this is the best way to get to know the movers and shakers in Free Software. In 2004 we lacked a venue until 6 weeks out... then once we got there the whole place was crawling with men in black. In 2005 we formed a corporation which means bylaws, contracts, talking to the state. In 2006 our AM keynote, Jeff Waugh - former Ubuntu community manager, was stranded during his time slot 3 states away at a layover gone wrong. In 2007 we had two live real penguins from the Columbus zoo who were late for their stage time. In 2008 Jono Bacon invited Dann of the Linux Link Tech Show to moon the audience. In 2009 we wondered who would be able to travel to a LinuxFest in the middle of a bad recession. This July we experienced a server outage just as we were going live with registration. Did we have some nail biting times? Yup. Do we give up? Nope. We are a show for the community and by the community. This is why we succeed and even laugh about the difficult times. We also learned that you can’t trust those wacky Ubuntu folks... Just kidding Jeff and Jono are awesome. The Ubuntu Community has brought us excellent speakers such as Jorge Castro, Mackenzie Morgan, and Pete Graner. We are happy to welcome David Mandala and you Amber this year! BLE: LinuxFest is a brand that I see going world-wide. We are just honored to be a large part of it. Many community-oriented Free software conferences have started in North America since our first inter-lug gathering in 2003. Ideally we want there to be a LinuxFest in driving distance to all. Columbus puts is in a good place to serve this purpose as most of the population is within a 500 mile radius. What about 2010? Will you be one of them? AG: There is going to be an UbuCon at the Ohio LinuxFest this year and you are speaking at the this event. Can you speak a little about the decision to add an UbuCon and what you are going to be speaking about? BLE: I first heard about UbuCon at Southern California Linux Expo 2010. Quite honestly I thought it was just for Ubuntu developers so I did not go. Later that weekend I discovered my mistake: UbuCon is about the entire user experience. The desktop user experience, especially for new end users, is a process that fascinates me. How can a non-technical-end-user go from Microsoft to Ubuntu? What else are people using? Android? Other Free distributions? Apple Products? My personal blog, whatwillweuse.com examines these questions. It is my assertion that this time next year, Ubuntu’s bug one will be resolved. My talk at Ohio LinuxFest UbuCon will discuss how Microsoft lost browser market share this year and why the desktop platform is next. The Ohio LinuxFest is proud to host its first UbuCon. We believe that because we have empowered the Ohio LoCo team, this UbuCon will an awesome community experience. All are welcome to attend, even if you do not use Ubuntu... even if you do not live in Ohio. BLE: We are a 100% all volunteer show that only exists when you show up. Register before Wednesday September 1. Again thank you Beth Lynn for the interview and I am looking forward to the the Ohio LinuxFest! See ya soon! Comments suggestions can be sent to Amber at: amber [AT] ubuntu-user.com.